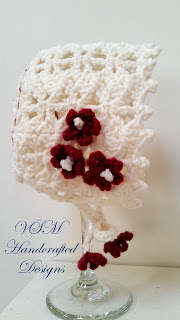 The thing with crochet is there is so much that can be made and done with yarn. From yarn bombers, to hats for cats, there is a myriad of things that you never knew existed out there. For me it's always fun when someone approaches me with and idea for something, and I'm able to help them make that idea become a real object. I thought it would be fun to share some of the most memorable designs that fall into my novelty category. Remember, if you see something you like, contact me to place your own custom order. 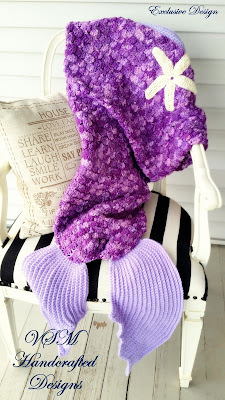 First up is the mermaid tail blanket. These are every.where. right now, along with the shark counterpart for these underwater predator fans. A few people did ask if I make them, but it was this particular order that I was excited to do. It was for a little girl I know and adore and her favorite color of purple made this even better. I wanted to bring more of a true tail look to the blanket and instead of a simple stitch I worked with something that gave the texture of scales. To add to that, I made up a starfish accent applique and fluted the fins. When it completed, I couldn't be happier with the results. I know it's going to fuel her imagination and become a much used item. Next novelty item is one I wish wasn't such a novel idea in our modern world. 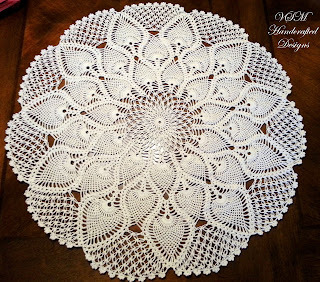 Doilies were used often in the decor of homes years ago. They were a way to dress up a simple chair or table, and often a way for housewives to show off their handy work. 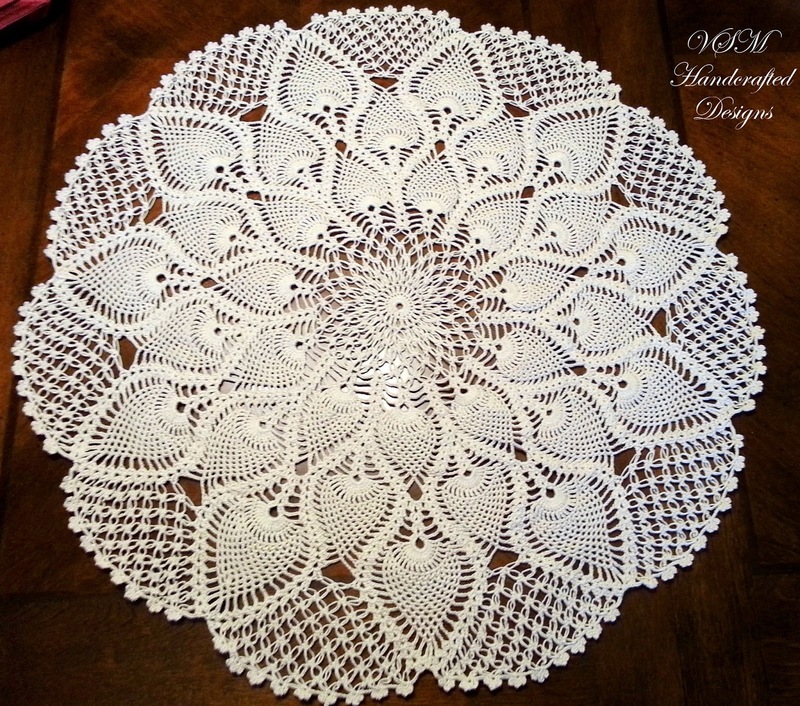 This past year, I've worked on a set of three doilies for another good friend. Each one was made using patterns from my grandmother's old collection from the 40's and 50's. It was so rewarding to work on something where I saw her own handwriting and notes, and then be able to pass it along to a person who truly appreciates the detail and time that goes into making these lovely items. I also thought I'd give it a try to make some doilies in different colors. I was really surprised and pleased by the results and am hoping to maybe make a few more in various colors. Another novelty concept I had a great time working on was the crochet tapestry look. Admittedly, I didn't really make any to sell, but I had wanted to experiment with the idea. I've made a few different panels and have a monogram one on display in our master bedroom. As for the others, I still need to figure out what I want to do with them, but I did enjoy seeing how the Russian method of crochet made it possible to recreate cross stitch and tapestry based patterns. This sweet baby bonnet actually came about while I was working at a show with many lulls in the shopping traffic. Made for a friend who, at the time, was waiting for her baby girl, I decided to give a nod to those old fashioned baby bonnets from the Victorian era. Delicate stitching and sweet little flowers made this ultra girly and gave it that old fashioned feel at the same time. 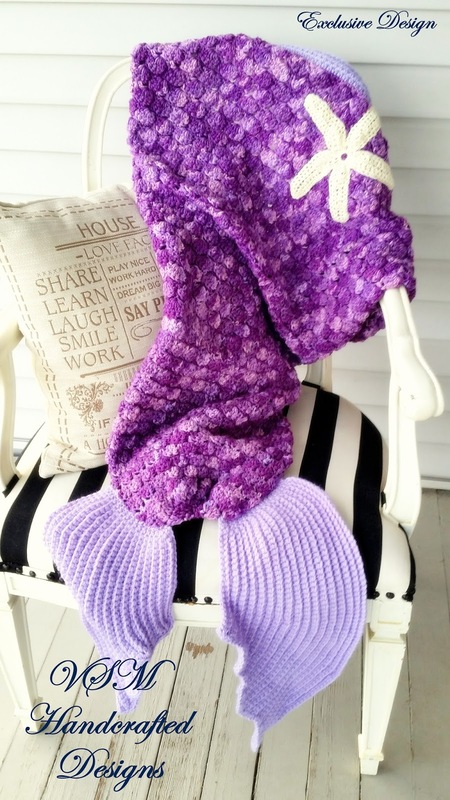 I love the way that yarn can become something so unexpected. It isn't something that needs to be limited to scarves and hats. Give it time and you'd be amazed at the things that can develop from a simple hook and strand from a skein. 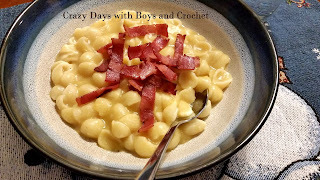 Dairy Free Mac and Cheese for the Grown Ups! When I first saw a recipe for a dairy free mac and cheese, I was super excited...that is until I saw that it called for a soy based cheese. Yeah, soy and I don't really care much for each other in high quantities. So, skip that one. 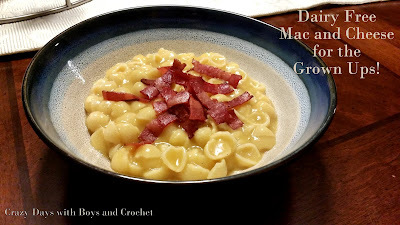 Next up, another recipe claiming dairy free, which it was, but also tasted more like chicken soup than mac and cheese. Finally, tried another and again disappointed with the overall flavor and mouth feel. Macaroni and cheese is one of those dishes that just screams "I'm here to comfort you!" Unfortunately, these recipes were more along the lines of "terribly sorry to get your hopes up." Yes, I know, I shouldn't expect to have a mac and cheese that's just like what mom used (and still does) make. That's when I realized I needed to think about what I wanted out of these dairy free promises. What was it about these particular meal that I liked? What seemed to be missing from my previous attempts? When I started looking at things that way, I discovered that I wasn't getting what I wanted because those recipes weren't going to give me that. First of all, I am big about mouth feel. I wanted velvety, rich and creamy. To add to that, I love a sharp cheddar bite so I needed some tang and deeper tones than a chicken broth could bring. Finally, I wanted to look at it and want to dive in because of the rich sunny color. Keeping all this in mind, I threw out the chicken broth and grabbed some beer instead. Then I decided that carrots were not going to be creamy no matter how much they were pureed, but those sweet potatoes could fill in nicely. Let's not forget that amazing cheeseless pizza I had a few years back that used caramelized onions instead of cheese, and omg, the sweet tangy flavor that brought to the table. All said and done, I now have a recipe I'll be turning back to because, well, I got what I wanted, and oh yeah, bacon...Is this going to be super kid friendly? Ehhhh, not with my picky eaters, but if your little one is adventurous, sure! Also, if you would like to make this gluten free, get yourself some GF pasta and switch out the beer for some very dry chardonay. As for more vegan friendly, omit that bacon (::gasp::) and add on some more caramelized onions on top. 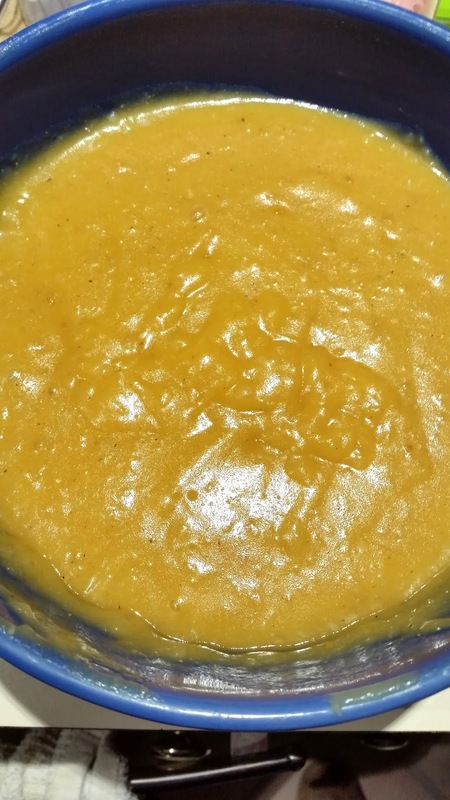 immersion blender, large pot, medium pot, large shallow pan with lid, deep medium bowl. 1. Peel your onions and thinly slice into half moon cuts. Break apart into the pan and add in the beer and a few dashes of salt. On lowest heat possible begin to caramelize your onions. This process, when done right, will take about an hour and half. You want your onions to become tender and a honey brown color when done and about a half the amount than what was originally put in. Keep your heat low, stir every so often and keep the lid on until the onions become transparent. Then you will want to remove lid and watch carefully making sure to stir often. Set to the side to cool. 2. Peel all your potatoes and cut into similar sized wedges, same for your sweet potato. Then add into your medium pot with the crushed cloves of garlic. Fill pot with water until everything is just submerged under the water. On medium low heat bring water to a boil, keep lid vented, and cook until fork tender. 3. Removed wedges of potatoes, sweet potatoes, and the garlic and put into your bowl along with half of the caramelized onions. Then carefully pour your reserved liquid on top. Using the immersion blender blend smooth. To get a more cheese like consistency, you will actually want to blend a little more than you would think until the mix becomes sticky. If it seems to dry, add in a little bit of water a few tbsps at a time. In the end you want this mix to be thick, creamy and very much like a fondue. 4. Boil water in the large pot and cook your pasta as instructed. When done save about a 1/2- 1 cup worth of boiled pasta water and drain pasta. Return pasta to the pot and pour potato mix on top along with the reserved water a little at a time until you are satisfied with consistency. Then add in your remaining seasonings, making sure to stir well. 5. Give the mixture a few minutes to cool down and meld the flavors together, then serve with a garnish of either the rest of the caramelized onions or the bacon, or both really.